BOULDER, CO--(Marketwire - February 9, 2010) - Plantiva announces the launch and immediate availability of the first natural product to clinically demonstrate that it restores breathing in less than 20 minutes. 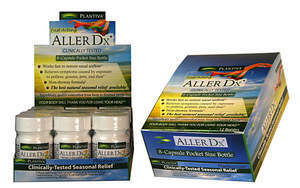 AllerDX is the first product to deliver significant scientifically proven results in an all-natural formula. AllerDX is a botanical formula designed to quickly relieve nasal blockages often associated with environmental sensitivities to pollen, weeds, mold, trees, pet dander and more. AllerDX is designed for both immediate relief and use over the long-term to help you maintain healthy nasal airflow. With daily use, the tendency for reactions to the environment is significantly reduced. Unlike most other options, AllerDX does not cause drowsiness, jitteriness or increased blood pressure. It was developed to control and moderate the immune system's overreaction to the external environment, without sedatives or stimulants. AllerDX has been tested in two double blind, placebo-controlled, cross-over clinical trials. One was a three-day treatment study and the other was a longer one-month treatment study. Subjects were exposed to a nasal histamine spray, which induced blockage of the nasal passages. Researchers measured nasal airflow every 10 minutes for the first hour and found that subjects taking AllerDX experienced rapid relief, starting within 10-15 minutes of exposure. And even more surprising, those same subjects taking AllerDX had better nasal airflow after one hour than they did prior to their exposure to histamine. AllerDX has also been tested by an accredited independent lab for substances banned by the World Anti-Doping Agency, so athletes can find relief and maintain better health as they train and compete. And as many athletes know, this is revolutionary, because until now there has been no dietary supplement which acts so quickly while being free of banned substances. Plantiva is a state-of-the-art botanical manufacturing company that was founded by an international team of doctors and scientists merging natural healthcare with modern medical knowledge and scientific research to create highly effective botanical health formulations. This is no ordinary crew -- they've held advanced degrees and positions with organizations including Bastyr University, London Institute of Tropical Disease, Yale University, Cornell University, the World Health Organization, China Academy of Preventative Medicine and the Beijing University of Traditional Chinese Medicine. And the results for their immune boosting formula, ImmuneDX, are so remarkable that they were awarded a patent for their proprietary blend of ingredients. Plantiva products currently available include: ImmuneDX, for strengthening and mobilizing the immune function, ViraDX, a companion product to ImmuneDX that works to restore a feeling of health when immune difficulty arises, and now AllerDX for environmental sensitivities.